I spent time studying this beautiful female jaguar in the waters of the Black Channel in Brazil’s Pantanal wetlands during my August 2015 wildlife expedition to the region. Her ID name given by local biologists was Patricia, identifiable by the unique rosette patterns on her face. I watched her as she was on the hunt for her next meal for some time. 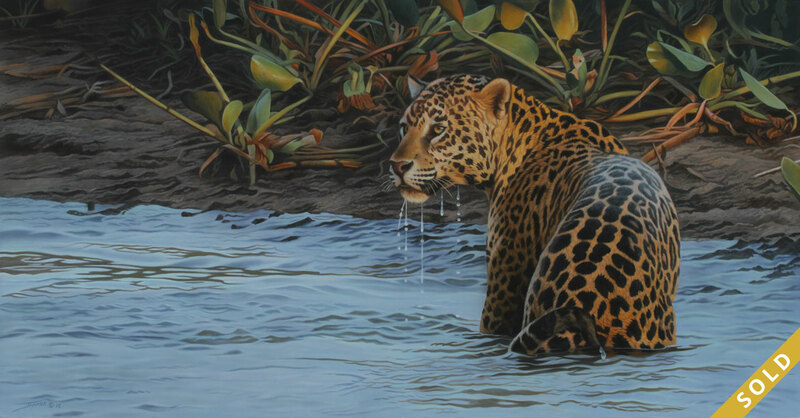 In the moment captured by this painting, she had just pounced into the water hoping to strike a caiman. Unfortunately, Patricia missed the catch, but did provide this brief yet stunning photo opportunity of her standing in the water with the warm, late day sun setting and giving her coat a fiery glow. In the background along the shoreline are water hyacinths, which are literally everywhere in the Pantanal. The jaguars in the Pantanal are considered the largest of their kind in the world, with lengths of almost 9 feet (2.7 metres) and weighing more than 300 lbs. (135 kg). Average weights of these gorgeous cats is about 220 lbs. (100 kg). Their massive size is due in large part to the high prevalence of their primary food source: the Yacare Caiman. One of the primary reasons I chose to visit the Pantanal is that it was still a relevantly new expedition and, as an artist, would offer me wildlife reference that was fresh, unique to the marketplace and exciting. To my knowledge, the Pantanal wetlands have not been exploited to any extent—at least not yet. Wildilfe artists can often be like some animals they paint; travelling in herds. One lemming goes over the cliff and there are 10 right behind it.